Salads are wonderful. They can be drizzled with a variety of dressings. They can be tossed with a multitude of ingredients. They can be topped with things like bacon and lechon kawali and still be perceived as healthy! Wishful thinking aside, salads are quite versatile. Still, one ingredient that’s present in a lot of salads is lettuce. Collectively known as salad greens, this leafy vegetable is often the base upon which salads are built. And this is also the first thing you grab at the supermarket when you decide to make your own. 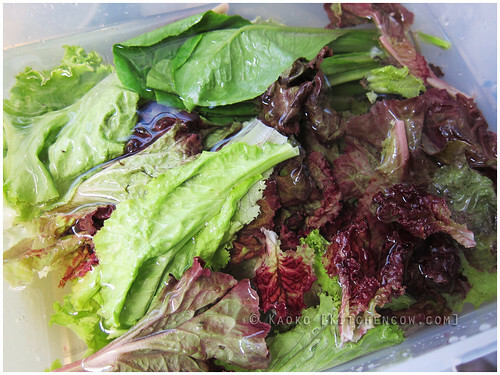 Next time you grab a head of lettuce, consider this simple procedure for refreshing your salad greens to get maximum veggie oomph for your salad. *sings* Wash those greens before you eat, give the germs a clean sweep! – points if you get the reference! 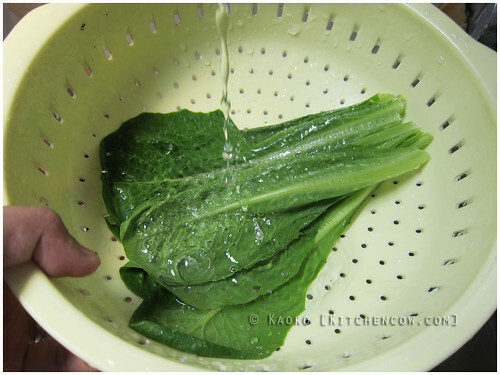 Start with a preliminary wash. Place your separated greens in a colander and wash with running water. Doing so washes dust, dirt and the occasional worm away. If running water is not an option, wash the leaves in a deep basin, making sure to swish the leaves at the top part so you don’t disturb the sediments gathering at the bottom. After washing, fill a deep basin with enough water to cover your greens. Add a few tablespoons of white vinegar and let it stay for 10 minutes or so. 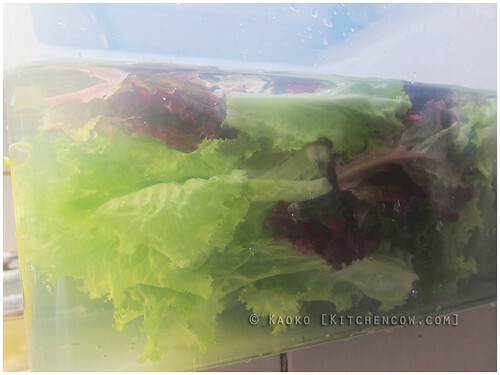 The vinegar is said to kill bacteria, while refreshing the greens. I don’t know the science behind it, but it does work. The leaves do seem crisper and fresher after a vinegar bath. 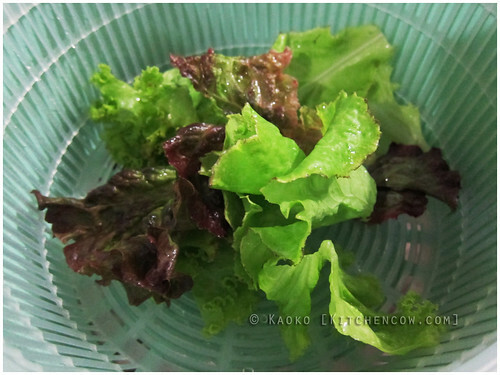 Once you’re done soaking the lettuce, spin a few leaves at a time in a salad spinner. If you don’t have one, you may want to consider purchasing one. 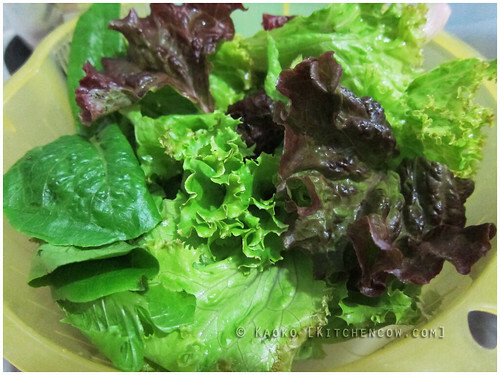 It’s not just useful for salad greens, you can use them for herbs and other leafy vegetables as well. 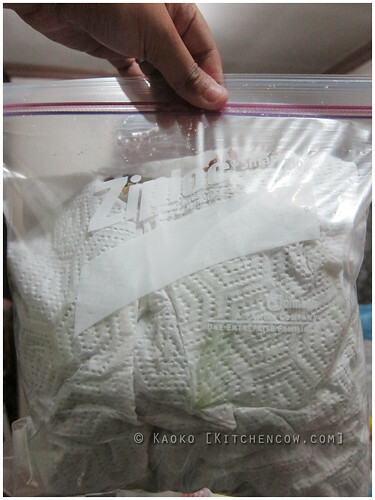 If you don’t have access to one though, you can simply drip-dry the leaves, then pat any leftover moisture off with a paper towel. Drizzle with dressing and nom! If you’re not using your greens immediately, layer them on paper towels to absorb excess moisture, then slip inside an airtight resealable bag before refrigerating. This lengthens the life of salad greens a bit, but it’s still best to use them as soon as possible. Store to eat another day. Next time you’re in the grocery, skip the prebagged lettuce section and go for the whole lettuce heads. They’re not only fresher, they’re loads cheaper too. Not only will your body love you, your wallet will, too.